For visitors to Glasgow who want to be at the heart of Glasgow life, day or night, Sauchiehall Street is the place to go. It is one of the main shopping and business streets in Glasgow and runs for 2.5 km from the City Centre to the West End of the city. 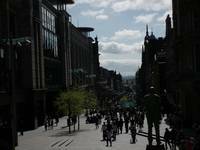 There is no shortage of sightseeing, shopping and entertainment on Sauchiehall Street. At the eastern end of the street you will find the Glasgow Royal Concert Hall and the Buchanan Galleries. Further west are all of the big names in high street retail, but also treasures such as The Willow Tearooms, designed by Glasgow's most famous architect, Charles Rennie Mackintosh, in 1903, and which are still operating today. Towards the Charing Cross end of Sauchiehall Street, you will discover a huge selection of restaurants, bars and clubs, like the ABC and The Garage. There are other points of interest here, too, such as the Glasgow School of Art, the Glasgow Film Theatre and the Royal Highland Fusiliers Museum. Discover all of the delights of Sauchiehall Hall by making The Sandyford Hotel your base. Our 3* hotel is located right on Sauchiehall Street at number 904 between the City Centre and the West End. We offer 55 comfortable rooms with en suite bathrooms and free Wi-Fi access. There is 24-hour reception at The Sandyford for your convenience and our friendly staff will always be happy to recommend places to visit and things to do on Sauchiehall Street. Our bed and breakfast rates are very affordable and include a full Scottish breakfast or the choice of a more Continental-style meal. 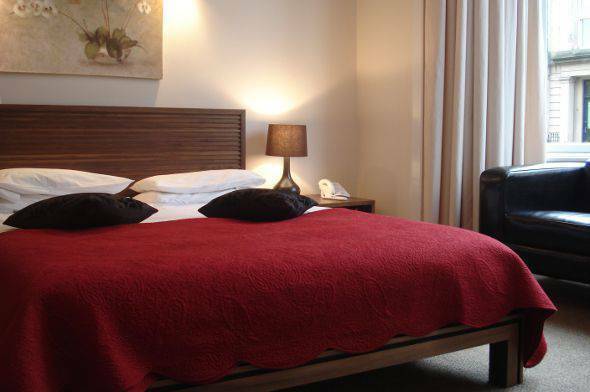 For cheap B&B rates in a prime location, the quality of the accommodation at The Sandyford Hotel is second to none. To book hotels in Sauchiehall Street, simply call our reception today on (+44) 0141 334 0000. We will be delighted to advise you on available rooms for your dates. You can also contact The Sandyford Hotel directly through the online booking form on this website.